I can already tell you that these boots will be getting a lot of wear this upcoming fall. I'm already sneaking them into my outfits even in this heat because I love them so much! Besides that, my beanies will be making a reappearance for sure. In less than a week, college will be starting up for me. Not only that, but actual Senate duties. We've had a few meetings over the summer, but its nothing compared to what I actually have to do now. I got a binder informing me on my duties as a Public Relations Senator, and I have to go around to the local radio stations on a weekly basis to update the DJ's on what's going on at my community college. While excited about having such a cool opportunity, I can't help but be a little nervous. Wish me luck! Now while I was out and about trying to find a place that was fairly private to take photos, I had a random run-in with some guys on their longboards. The campus here is crawling with people who like to spend their evenings just longboarding, biking, hanging out, and walking their dogs. For a fashion blogger trying to quickly get some outfit photos, it can be mortifying dashing back and forth between a tripod and holding still in a pose as people pass by. I was in the midst of snapping a few shots when these two college guys wheeled right up to the spot I was at on their longboards. One came to a stop and sat down on his board right there! I hurriedly unsnapped my camera from the tripod and pretended to scroll through the images, all the while semi-ignoring him. Then his friend joined him and they started talking, and one made a random comment towards me. "Hey, did you see that squirrel? You're the one with a camera and you missed it!" I just smiled and said, "Its not the squirrel I'm trying to capture." Then he unhooked a tiny camera I hadn't even noticed from the front of his longboard. "We were out trying to record some fishies. Check it out." I hesitantly walked over to where they sat and checked out his footage. Apparently, his tiny camcorder was waterproof, and they'd caught some cool recordings of the fish in the nearby fountain. Then we started joking about how his friend didn't have a job and the only downside to that was the lack of income. I mean seriously, the only motivation for us to go to the jobs we have is the check, right? Haha, so there's a random occurance to share with you girls. 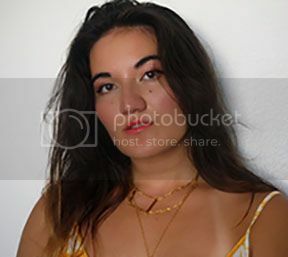 What's the most awkward/interesting run-in you've had while out taking outfit photos? 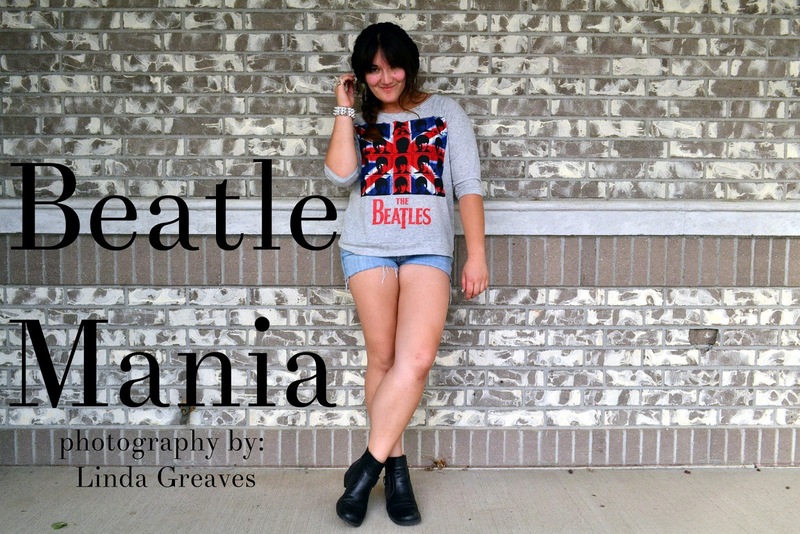 I love your Beatles shirt! And those boots are gorgeous. You're so lucky you found them while thrifting! Lol I have the same moments when I go out to take pictures! People love to see what I'm doing. I get so shy/embarassed. These pictures turned out SO awesome! I love the wall in the background! Your outfit is perfection. I am insanely envious of your ability to rock a beanie. You have definitely given me the inspiration to give it another go! Oh, and if I had those fantastic booties, they would be on my feet 24/7. SO perfect! Are you ready for your second year of college?? Excited about going back? I am excited for you and your new duties! How fun to go around to radio stations! This will be great experience! Love your top, that's adorable! Good luck with college and all of your exciting opportunities!Haha, that's a funny story. I don't mind shooting around strangers but it's when we go to an area where someone I know might pass by that I get antsy! 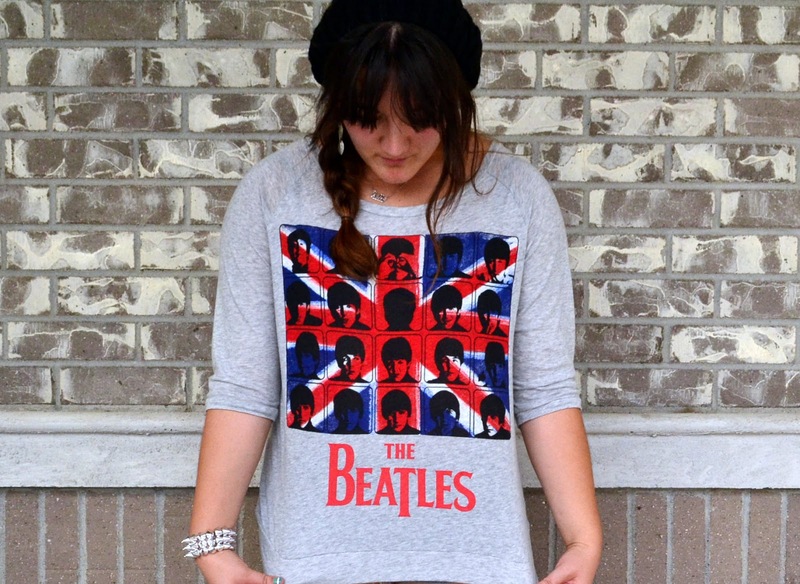 For someone who's a huge fan of Beatles, I absolutely adore your shirt. This entire ensemble encapsulates the spirit of that era so well, I LOVE it! awesome sweatshirt, and love the black boots, complete the whole look!!! You look awesome I love the boots and I'm so jealous of your top! Oh sweetie this outfit is fresh and great. Perfect for summer. Okay, moving on! Well, at least those guys were totally decent, you know? And maybe somewhat creative with their... fish tapes. Hahaha, that's pretty awesome. It's nice to know that there are other people out there who lug cameras and videotapes around and such. I saw a girl taking a picture of her cookie once and I was all, "GIRL I FEEL YA"
Hehee, I love your Beatles look, Linda! That shirt is way rad. And those boots? Yeah, they definitely look like they were made for walkin'! I can see why you don't wanna get out of them. Sounds like you'll be busy with the college-ing and Senate-ing, but I think it'll serve you good--and what an awesome opporunity indeed that is with being able to report to someone on a weekly basis! Like a mini job. Be sure to stick that on your resume, sweet thang!! Oh, mine would be my dog! No one is ever around. My HM is around but he doesn't count. LOL. I mean he just goes about what he is doing. But Lil' Girl needs to be told to get out of the shot. I have many deleted pics of her wandering into the pics. You handled the guys well. I love your BEATLES shirt!!!!! Thanks for all of your fun comments to keep me plugging along. Cool shirt and great boots. Hello there senator :) Lovely look, so fun. That Beatles shirt (are they some new band just on the scene--why didn't they get music Monday then :)P)--I am kidding, dear. Pretty big fan of the band and very big fan of sweet and lovely you. And those shorts sure live up (way up) to their name :) As I am also a big fan of your gorgeous legs no complaints here, especially with those last 2 shots. Thank you SO much for those. Good luck visiting your radio stations. They will be fun trips I bet so no worries. Just be yourself and everything will work out great. oh i LOVE your shirt Linda! the graphics is so cool! interesting match with your cut-offs and boots :) i LOVE the outfit i guess! i'm currently in the search for a pair of black chelsea boots :) this one automatically becomes an inspiration! Sweet of the guys to stop and chat too, I'd be so embarrassed I'd probably just walk off, haha. I was running late one morning so setup close to home for pictures, until my neighbour came out just as I had setup the tripod and stood there....I picked up the tripod and run to a more secluded spot so they wouldn't see me taking photos and ask questions...haha. I really love this look on you Linda...everything works so well together...and what awesome boots! Hi Linda! 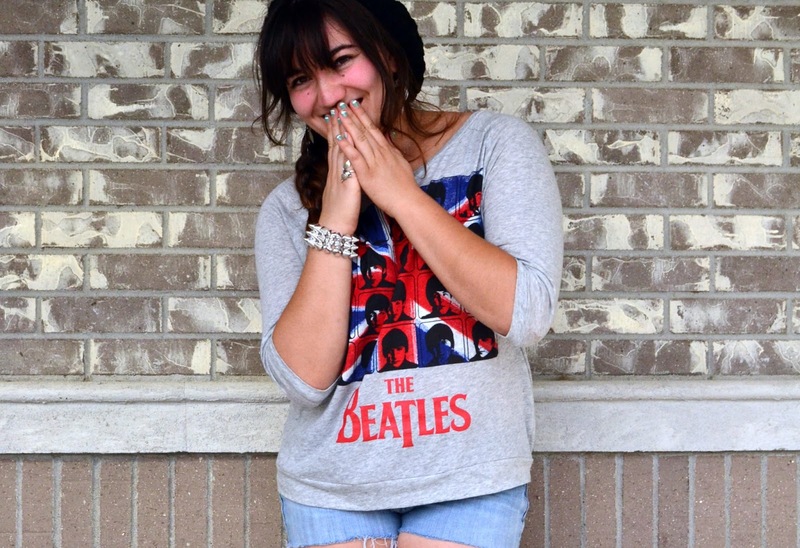 You are Brit Chic in this adorable ensemble, the rock printed tee is ultra cool. Those are my kind of boots, they seem really comfy too. Thats so weird, i think those guys just wanted an excuse to make conversation with a pretty girl. Oh my, this sweatshirt is just awesome and I also love your shorts-boots-combo! I'm sure you'll do great as a senator! How you can tell with them? I think I will be so embarrassed to even said "Hi". You are wonderful, Linda. Your short boots will be a hit in Fall :D I want a pair also for next season. I am looking for the ONES. I always have such silly run-ins with strangers when I take photos, too! I've met a lot of kind people who offer to take a photo of me if I look like I'm struggling with my tripod, haha! Love your outfit! lol those guys sound nice, and ya the whole point of having a job is to have the paycheque, in which allows you to indulge in stuff, no? or else I really don't know what I'm doing in life right now. Someone's looking hot hot hot! ;) Loving this look! I'm still on the lookout for boots like that for fall... once I find them, they will be my fall go-tos! hahaha...that's so funny but like nerve-racking too. I usually give my camera to my friends to snap a fiew shots and even then it's strange when people walk by..Once someone asked me why I don't smile in my pictures :p.
You look really cute btw :) Love that shirt!! As far as random occurrences...I was taking pics with my tripod one day at the park and these people come and sit right next to me - mind you the entire park was empty - and start jibber jabbering about work gossip etc. And there I was alone (literally right next to them taking pics of myself). I didn't move on principle...But I was totally peeved!